I'm back to drawing again, albiet slowly...but I had time to continue my Monster project. More from the Monster Art Series, my take on the age old Evil Genius. BTW, these will be on sale in the coming months. Stay tuned for details. If you live in the Queen Creek, AZ area, you can hear Jawbone simulcasts starting tonight at 6 PM PST on their community radio station, 99.1 KQCX. Then you can hear Jawbone, every Sunday thereafter stating at 6 PM PST. Jawbone joins the ranks of other podcasters including Aaron from The Big Show, Keeme, Matt and Chris from The Metal Show and of course, Professor Nutmeg. It's great to be in such esteemed company. Thanks for listening! Hope you enjoy what you hear. Our friends, Derek and Swoopy, from the Skepticality podcast have linked up our ghost photo on their forums and are currently trying to debunk it. You can join in on the discussion here. Jawbone #66: Get Off Our Swamp, Augie -- Schnell! It's our first show back in the attic studio after a long break. Listen in as we talk about our vacation, the ghost photo, we hear a review of our show, answer a lot of our listener mail and listen to voicemails. I also discuss how I wanted to hug my sister-in-law for planning such a great vacation. Plus, DJ Hojo returns with his take on our trip to Virginia Beach. Mystery of Ghost Photo Revealed! Well, we figured out whose face was in the ghost photo that Nora's brother George took. It was none other than American Idol runner-up and fellow Clevelander, Scott Savol! That explains the goggles and the eerie feeling of dread and hostility. Thanks to Aaron for the heads up. In the conclusion of our trip to Virginia Beach, we explain what we saw shortly after we visited the Cornwallis cave during our Yorktown Ghost Tour. We take an exhausted trip to see dolphins in the Chesapeake Bay and enjoy a fine night at the Boardwalk. Join us, won't you? Ok, for those of you who are curious about the ghost photo, here's the story: Nora's brother, George, shot this photograph while we stood in front of the Cornwallis cave. The figure to the extreme right of the photograph is our tour guide. At the time this picture was taken, she was explaining that she doesn't like being near the cave at all, and has felt this way since she was a small child. (Her father was apparently a ranger with the National Parks Service in Virginia.) George shot the photo without a flash and with a longer exposure. The light is from a lantern that sat at the tour guides feet. Directly behind the shoulder of our tour guide, everyone noticed what looks to be a man's face. You can get a better look in this detail photograph. I know a lot of skeptics will say that this is "matrixing", where the brain creates familiar objects out of unfamiliar, jumbled images. All I know is that I see a definite face. And it seems kind of odd that that would show up as our guide was talking about not wanting to go near the cave. Maybe someone should tell her that's she's not safe outside the cave, either. That's our story and we're sticking with it. If you want to hear more, download or subscribe to our latest podcast. Jawbone returns after a very long break with a special show live from Virginia Beach, Virginia. In this episode, we podcast from our own private beach, The Virginia Science and Museum and Aquarium and Historic Yorktown. Listen in as we take a ghost tour of Yorktown and encounter something "otherworldly". Plus, as a special treat, the musicians in this show all hail from Virginia Beach. On we go! We are back from a long vacation in Virginia Beach and we're ready to hit the ground podcasting. I recorded a ton of stuff on the beach and around the area, so stay tuned for some cool shows this week. The shows will be full of surf, sand, horseshoe crabs, dolphins and maybe even -- a ghost. Gotta go edit up the shows and I hope to have them up this week. If you look to the right, you'll see a few new versions of our promo. We have the original promo that went out in our feed earlier this month, another version featuring our theme song, and finally, a remixed version by DJ Hojo. Grab one or grab em all and feel free to play the hell out of them. Tonight, I was a guest on one of my favorite podcasts, ExtraLife Radio. Scott Johnson's bi-weekly podcast is one of the most engaging shows out there dealing with video games. movies, comic books and general geekdom. I've often found myself talking to the screen, totally trying to get into the conversation, while listening to one of his shows. Some people would call that mental patient behavior. I chalk it up to being totally involved in the subject matter. Incidentally, Scott also draws a web comic called (surprise!) Extra Life. All in all, we had a great conversation and I was glad to be a part of it. I even let people know about how Jawbone really started. You can check out the show here. And while you're at it, take a peek at Scott's comics. They're totally awesome. BTW, if you'd like to see my foray into webcomics, check out IP. Since we are on hiatus, I think this would suffice for a bit. Here is our brand spankin' new promo produced by our friend and voice of Podcast Outlaws, Adam Raimer. Adam is a phenomenal talent and is extremely easy to work with. If you need a promo or anything else for your show, drop Adam a line here. Feel free to grab this promo, play it on your show or simply stick it in your ear. Just remember to flush wth warm water afterwards. Just a reminder if you are in the Cleveland area, and you'd like to see some of my artwork, you can visit the Pop Shop Gallery and Studio for "The SideKick Show". This will be the first time my artwork has ever hung in a gallery and I'm very excited about it. The address is 17020 Madison Avenue in Lakewood. You'll see a few of my drawings hanging up as well as the work of other talented local artists. Unfortunately, I won't be there in person, but the show should be interesting regardless. Also, stay tuned to the show and this blog for more exciting information about even more upcoming gallery showings and my artwork possibly coming to a town near you! Great googly-moogly! We keep the month of August moving with yet another podcast. Tonight, Len talks to Fourteen, who is behind the wickedly hilarious art blogGallery of the Absurd. She's great fun, and a joy to talk to. In fact, we're thinking we might make her a regular guest on the show. Also, more listener mail, voice mails and tons o' fun from our attic studio. Join us, won't you? Fergie of the Black Eyed Peas wets herself. As does Neil from Borderline and -- (GASP!) Mr. X! Hello to all our fellow Lakewood-ites who are finding us from the story in the Lakewood Observer. We'll be doing a show later tonight, so you can hear what all the fuss is about. We hope you enjoy the show. And if you do, subscribe! From Boing Boing: Astronaut Steve Robinson seems to be the first podcaster from outer space. From Something Awful: AdCouncil PSA's get a decidedly twisted working over in this set of images. Read all the copy. Some of the stuff is downright hilarious. WARNING: Some of these are kind of off-color. So, be forewarned. Onward! From Drawn! 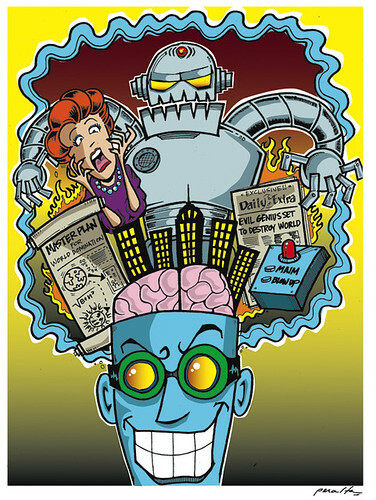 The Illustration Blog...Very cool site for fans of Mystery Science Theatre 3000. Here are all the posters (and more) of the movies that were MST'ed. Jawbone #62: Goin' Cruiseboxin', So Buckle Up People! Podcasting live from the Lakewood Arts Festival, we do an interview with Cruisebox. We also audition listener mail themes, share voice mails, e-mails and more! I am trying to get everyone to use one feed in order to simplify my life. So if you can please take a moment and update your feed to point to this feed that would be awesome. Thanks all! Yes folks. We have heard the complaints about the god-awful slow service from our new hosting service. So as of today, we have started using Libsyn. You should notice a significant increase in speed for our upcoming shows. Also, we uploaded the newest show again (Show #61) so it be showing up in your aggregator. We wanted to make sure everyone gets the latest episode. We apologize for the inconveniece and hopefully this will fix everything for now. Let us know how this new service is working for everyone. We start out the month of August with one jampacked show. Voice mails, mashups. awesome tunes and much, much more. Join us, won't you? Thanks to Redboy for the chopsticks. What happened to our feed? An explanation. Listener Mail themes...we are still open for submission. We play one from Neil of the Borderline. Our own personal theme songs. Do I look like Steve Carrell? A rambling voice mail from Skepticality. We answer them back via Skype. Voice mail about something we broke. More information about my upcoming gallery showing. Check it out if you're in Cleveland. Remember to vote for us over at Podcast Alley!